I've had an obsession with Lucite/acrylic furniture for a while now and lately, I seem to be noticing it everywhere. 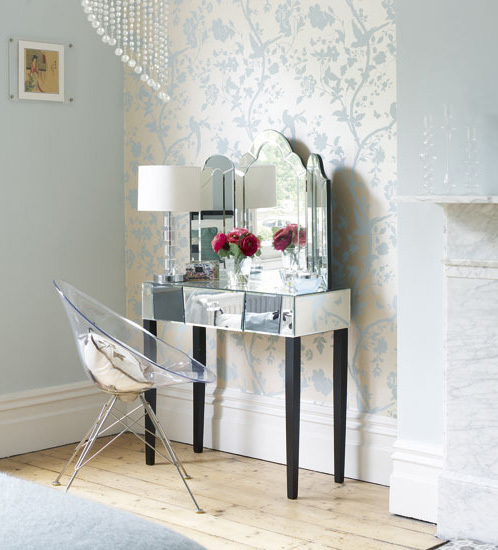 Who knew crystal clear, see-through furniture could look so chic and be used in so many different ways? Chairs, cocktail and console tables, bench and ottoman legs, desks, light fixtures...the list goes on and on. And the best part is that you can place a piece of Lucite/acrylic furniture in just about any setting - modern, traditional, industrial, rustic...as you'll see in the gallery of photos I've pulled together. I'm especially in love with the Louis Style acrylic dining chairs from Room Service (image #14). Those have been officially added to my ongoing / neverending home decor "wish list"! What do you think about this furniture style? Would you use it in your own home? Cute title! Mmmm, these rooms are chic. The first pic - the kitchen - is so pretty. 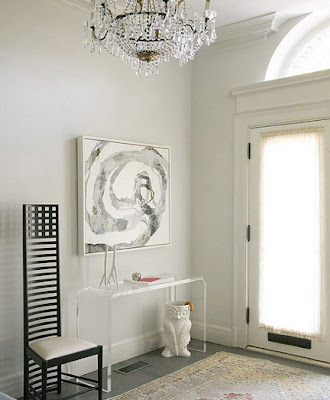 And I love everything about the entryway with the lucite table and owl umbrella stand. The artwork, the chandelier - everything was perfect. 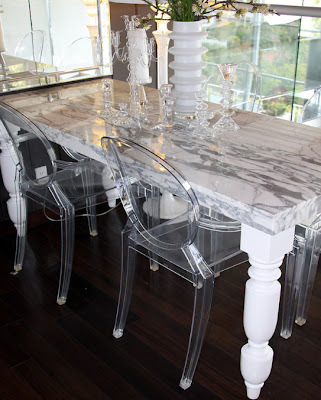 I like lucite for coffee tables and consoles...waterfall tables are my favourite...as for chairs...not all around the dining table..a couple of louis ghost chairs at the ends maybe or better still one for the home office...anything more than that...and I'd be wiping my 2-yr old's finger prints all day!! 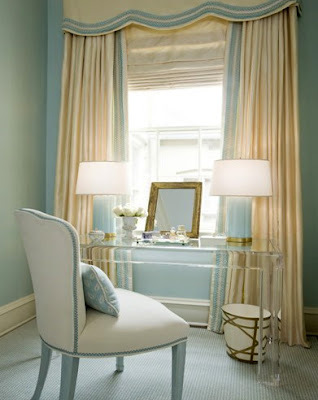 I lusted LUSTED after one particular lucite chair for two years. When I finally went to purchase it and actually sit in it, I had to admit it wasn't worth it. I was quite crushed. But I love the look and would try other pieces. I LOOOVE lucite :) I have a ghost chair and just adore it! 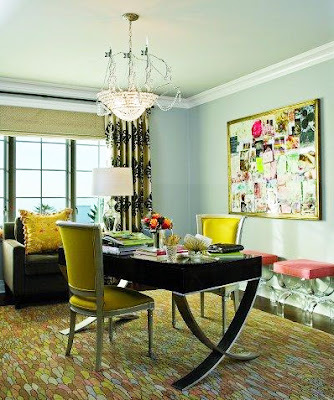 I love the image with the lucite coffee table with gold accent hardware... what a fabulous mix of inspiration! I'm still a bit on the fence with lucite as furniture. I've been seeing it all over! A local restaurant recently did away with the old wood chairs & added in lucite ones. Its not the most flattering or appetizing to see. I think some of the table look great. But then again they look like they aren't there. Allows other things to be the focus. Dunno. I think its going to be a trend for sure but for how long? I don't see these poor things lasting the time and reckon it'll start looking dated sooner or later. However I do like some of the coffee and side tables, rather an interesting look! I have been on the search for a small lucite end table to introduce to our small home. I think it is a fantastic idea for small spaces. Now that I see the desk as well, that gives me new ideas. Also love the bench. Yes, please! 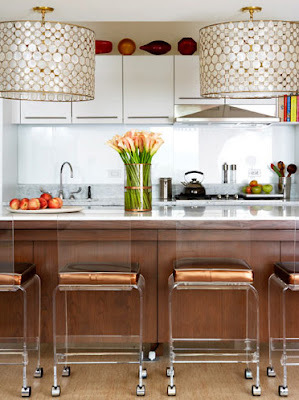 I especially love the barstools in the first two pictures! Love it. I am still remorseful about a lucite end table that got away from me on Ebay. I love these. I've really wanted a lucite coffee table for a while now. They just make the rooms seem so much larger! wow. you've got that right. 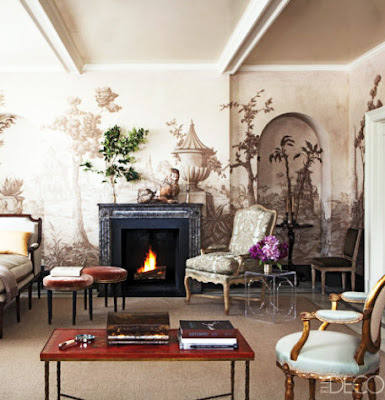 this is my ideal style for a home. two take the win for my favorite room. the very princess-esque dining room and bedroom. ah. i love. i may be a city girl, but if i were to have a suburban home, this would be it. I love all the images you pulled together. Lucite wouldn't work in my place, but I think it's so cool and chic. 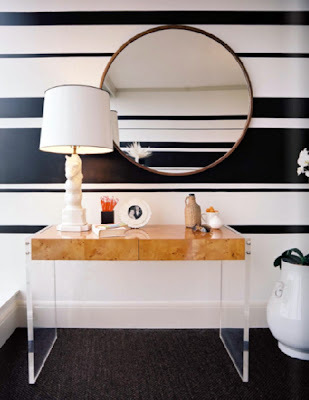 I am LOVING lucite right now... but agree it's a trend and will fade. The beauty of trends though, is that they WILL come back! I particularly like the look of just one chair, at a desk or in a corner. Cute post! Absolutely! 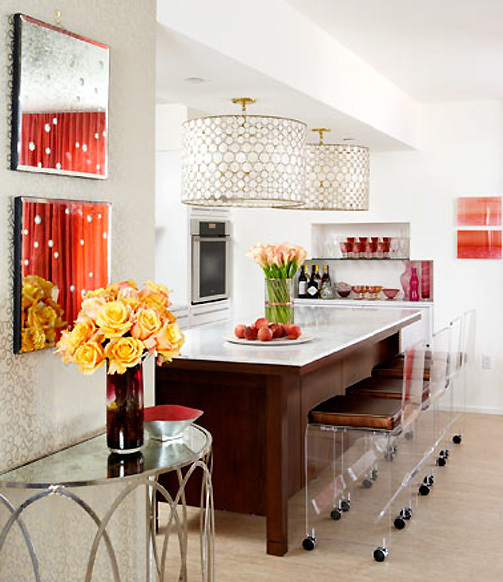 I adore the look of lucite! Especially those Louis chairs! They are truly fitting in in every type of environment! Fantastic! 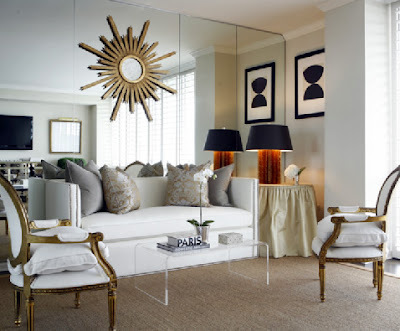 Lucite furniture I like especially combined with white and mirrors. I completely agree--a touch of Lucite adds a fresh touch to any decor. And it looks even better in person than in photos. A great buy are Ikea's Tobias lucite & chrome chairs--only 99 bucks. the chairs in the first picture are amazing, and you are right, lucite works with every style, and specially in small spaces, they dont stand out. I have two chairs in my home and i just love them! Julie, I LOVE lucite! Of course Ghost chairs have always been my favorite but I'll take any of it, really. This is the best roundup -- a lot of images I have not seen! I agree with you, lucite is fabulous! I love how versatile it is. Love the coffee table in Pic # 11, and have been trying to track one down for ages! 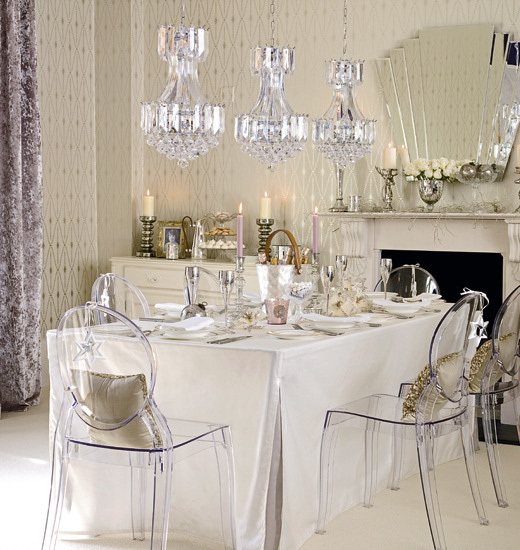 I love all this lucite and chrystal, it is just what a modern room needs, a little sparkle.